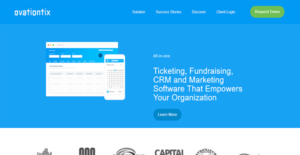 OvationTix is a platform that integrates ticketing, fundraising, CRM, and marketing tools for an organized management of your live event needs. It offers you top-notch flexibility when it comes to controlling your ticket prices and the solution even allows you to create unlimited discounts and different ticket or subscription bundles. Because of this, you can persuade your audiences into giving more to your organization. With OvationTix, you can also catch the attention of your target market with clever marketing campaigns. The software lets you utilize customer data and various marketing tools to create targeted offers and fundraising programs. You are also afforded campaign tracking tools so you know how people are responding to your efforts. As such, you can make informed and better decisions about the utilization of your marketing budget. OvationTix puts everything you need to manage your event’s ticketing under one umbrella. It enables you to oversee online, phone, and in-person ticket sales so you know where your sales are coming from exactly. Apart from that, the application lets you offer different subscription packages that give audiences more choices. With multiple bundles in place, people can choose what they want and be willing to pay more for it. Even when people are already in their carts and ready to pay for their tickets and bundles, you still have a chance to increase your sales. That is because OvationTix enables in-cart cross-selling. This way, you can suggest other merchandise that your customers may be interested in. Or you can interest them in donating more to your campaign by offering freebies. OvationTix is equipped with a full-featured CRM that aggregates customer data. You can segment this information to find out who are your supporters. With that material, you can create tailored subscription packages and hyper-targeted campaigns. The CRM also provides you with task management tools that help you make sure key donors are well taken care of and that interested individuals are converted into paying audiences. A key to success is knowing how well your efforts are paying off. OvationTix helps you achieve that with its standard and financial reports. These allow you to see the level of attendance in your events and generate specific information with flexible filtering. When it comes to finances, the software lets you know which channels are generating sales and the payment types most popular with people. Having this information on hand allows you to create campaigns later on that could enhance profitability. If you are considering OvationTix it may also be sensible to analyze other subcategories of Best Event Management Software gathered in our database of B2B software reviews. Each enterprise has different requirements and requires an application that can be personalized for their size, kind of workers and customers, and the specific industry they are in. For these reasons, no software can provide perfect tools out-of-the-box. When you try to find a software app, first be sure what you need it for. Read some OvationTix reviews and ask yourself do you need basic tools or do you require sophisticated tools? Are there any industry-specific functionalities that you are looking for? Get the answers to these queries to assist your search. There are multiple aspects that you need to mull over and these include your finances, specific business needs, your organization size, integration needs etc. Take your time, try out a few free trials, and finally zero in on the system that offers all that you want to improve your organization efficiency and productivity. How Much Does OvationTix Cost? OvationTix is a ticketing solution that empowers organizations to upgrade their ticketing management for live events. The base software is free to use though the platform gets a portion of every ticket sale. The details of this are included in the enterprise pricing of the application, which is available only upon request. If you are interested, you can get in touch with sales by phone. Alternatively, you can request a callback via the contact farm. We realize that when you make a decision to buy Event Management Software it’s important not only to see how experts evaluate it in their reviews, but also to find out if the real people and companies that buy it are actually satisfied with the product. That’s why we’ve created our behavior-based Customer Satisfaction Algorithm™ that gathers customer reviews, comments and OvationTix reviews across a wide range of social media sites. The data is then presented in an easy to digest form showing how many people had positive and negative experience with OvationTix. With that information at hand you should be equipped to make an informed buying decision that you won’t regret. What are OvationTix pricing details? What integrations are available for OvationTix? OvationTix can connect with MagTek for mobile credit card swiping. Aside from that, the solution can integrate with the Google Tag Manager and Google Analytics. If you need more information about OvationTix or you simply have a question let us know what you need and we’ll forward your request directly to the vendor.